At the recent Health Enhancement Research Organization (HERO) Forum, Dr. Kerry Evers and Dr. Sara Johnson were named the 2018 recipients of The Mark Dundon Research Award as part of the presentation of the 2018 HERO Health and Well-Being Awards. As co-CEOs and Presidents of Pro-Change Behavior Systems, Inc., it makes sense that Dr. Sara Johnson and Dr. Kerry Evers would be the first co-recipients of the Mark Dundon Research Award. Both are well known for their expertise on theory-driven approaches to health behavior change, for implementing evidence-based behavior change strategies, and for identifying methods for increasing program impact. They have dedicated their careers to research on and the dissemination of best practices in behavior change to advance population health and well-being. 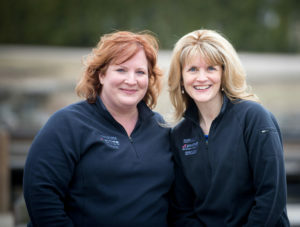 Together, they have overseen millions of dollars in research grants from the National Institutes of Health to conduct research in diverse populations that addresses a variety of behavior change challenges, such as substance use prevention among active military and veterans and chronic pain self-management. This award is a clear reflection of Pro-Change’s commitment to ground-breaking research to drive innovation in the science and practice of behavior change.